Hello lovelies! As you know, it’s Sci-Fi Month here! 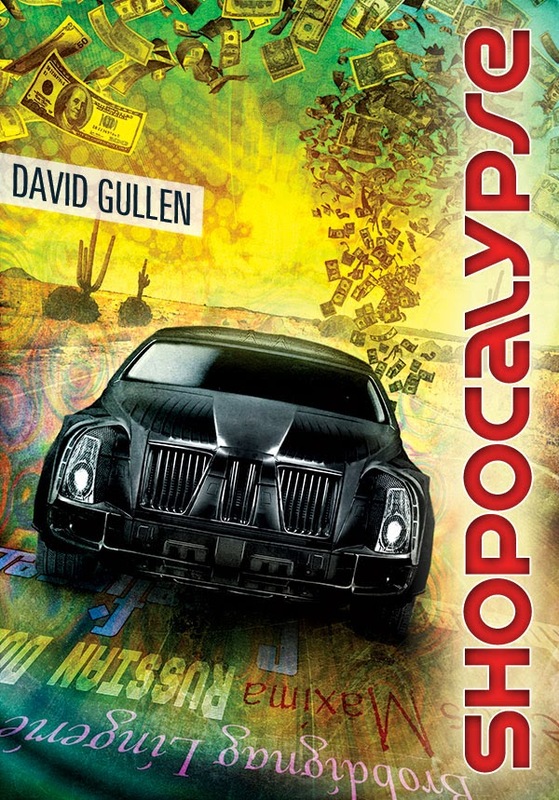 And today, I am very happy to introduce David Gullen, author of the near-future sci-fi novel, Shopocalypse. Ara: David, thank you for taking the time to do this interview. You must be a really busy man and I do appreciate you being “here” today. :) Please tell us a little bit about yourself. David: Hello Ara, it’s good to be here! I think I’m probably about as busy as many writers - most of us have day jobs and mine is in tech support for a small IT company. I’m fortunate in that I only need to work at this for three days a week, and I spend the rest of the time writing (or as other people say, staring out the window). I like to write early, it’s when my mind is freshest. Evenings are usually spent doing other writerly things such as reading, rewriting, critiques for other writers in my writing group, blogs and general catching up – tasks that need less creative brain power. I was born in South Africa to English parents, I have three grown-up children, and I live with fantasy writer Gaie Sebold. We both got to several genre conventions each year, big ones like World Fantasy, EasterCon, EuroCon, and smaller ones like BristolCon, EdgeLit and Andromeda. If you see us please do come and say ‘Hi’. David: Plants are brilliant things of incredible variety and resilience. We take them for granted but compared to us they are a deeply alien form of life. A seed grows in a corner and a few years later a ten metre tall tree has insinuated itself into the garden. You chop it down, but too late, two dozen more seeds are already growing. Plants can’t move but they spread themselves around efficiently and can be very tenacious. Of course, they are things of immense usefulness and beauty too. As a child – and maybe I was a strange child – I loved helping mum in the garden and learning to grow plants. It fascinated me that these delicate green things could grow as it were out of thin air – which is exactly what they do as it turns out. Water aside, the entire bulk of a plant is drawn out of the air using energy trapped from the nearest star, an amazing trick. When I trained genetics was an infant science. Now it’s set to start a new revolution. I’m supporting a Kickstarter project to make glow-in-the-dark plants. One day trees might replace street lights – how cool is that? Ara: Very cool, indeed. If this will happen, I think most kids will really love gardening. And I think it's great that you become interested in this area at an early age. :D Before we talk about your latest book, I just have to ask. Did you always want to be a writer? And do you have any advice to bloggers out there who want to become a writer, too? David: Looking back I can see I was always telling stories. When I was young I used to draw little pencil adventures; at school I co-wrote a play with a friend and performed it at local hospitals. Later on I created worlds and adventures for table-top role-play, mostly AD&D. It was only after I stopped gaming that translated into a desire to tell stories through writing. Advice? Oh gosh, there’s a mass of it out there and some of it is pretty good. In the end it comes down to a few simple pragmatic things. First off you should have read a lot. Writers write, so make your writing a habit like breakfast or going for a run, something that you just do and do regularly. And always finish what you start because five half-finished stories are no stories at all. Always try harder. Write for yourself, write the stories you want to read and care about telling, don’t try and second guess what other people want and don’t do what they want you to do (unless you get excited by the ideas and make them your own). I think this is very important. Ara: Thank you so much for that wonderful advice. So, why the Sci-Fi genre? I’ve read somewhere that this genre is really hard to define. What do you think about that? David: You’re right! Some people say if you take out the science and the story still works it’s not SF, others say the science has to be plausible, so faster than light travel is out for example. Another view is it has to be in the future. Margaret Attwood is supposed to have said SF is ‘all squids in space’. I say if it looks, walks and quacks like SF, it’s probably a duck from the future. You’ll know it when you see it. SF lets you do a lot of things: write a story with grand sweep; explore what might come from where we’re going today, or hold a mirror up to the world. SF writers in Soviet Russia wrote SF so they could write about politics. It’s a big universe, you can go anywhere and do anything. This obviously includes good storytelling and engaging characters, the same as for any genre. Ara: "I say if it looks, walks and quacks like SF, it’s probably a duck from the future." -- I love this! :) I have to be honest; I am new to the genre. I mean, I’ve seen some sci-fi movies but haven’t really read a lot of sci-fi books. I am definitely interested in the genre and just never had the chance to explore more. Now, when I’ve read the synopsis of your book, I was like, “Shopping? Nuclear War? And cars? That’s it! I have to read more sci-fi novels!”. Please tell us more about Shopocalypse. David: Shopocalypse is an SF road movie. It’s the book of the film (except nobody has made the film) so it has short chapters, fast cuts, sharp dialogue, intense action – and a talking car that’s smarter than any of its occupants. Shopocalypse is set in a near-future America of extreme consumerism. The rest of the world has moved on, the southern states are partly uninhabitable due to an endless hurricane, and the economy is failing. My two heroes, Novik and Josie, accidentally steal a car with a trunk full of hot money. They decide to try and change the world for the better by embarking on a gigantic shopping spree. Meanwhile, the gangsters want their money back, and the president has her own plan for a better world – global nuclear war. The end is so nigh even some aliens have turned up to watch. If you want an elevator pitch, it’s Red Dwarf meets Top Gear meets The Day After Tomorrow. Shopocalypse is published in paperback and e-book formats by Clarion Publishing, with a fantastic and very original cover by Ben Baldwin. Novik and Josie have a lot of catching up to do. Two years he's been in jail; two years she's been waiting. They never want to be apart again. A stress-filled encounter with some "Old-fashioned Boys" at a chain eatery turns their best of intentions upside-down; they're now on the run and in posession of a super-hot sentient muscle car and over 190 million dollars, covered with a potent psychoactive power. Welcome to the Shopocalypse. David: I’ve a short story collection out at the end of the year, and I’m working on the final scenes of a fantasy novel about a street kid and petty criminal called Carl White. The story moves between modern London and a place called the Underwild - and the worlds that lie beyond it. And there are the sequels to Shopocalypse, and a couple of collaborations Gaie and I are excited about, and… and… There are always too many ideas and not enough time. It can feel frustrating but it’s actually a very good place to be. Coffee, sweet tea or hot cocoa? David: If those are the choices – cocoa, with a flake dipped in. Ara: If you have to choose one sci-fi book as your absolute favourite, which would it be? And that’s not even getting started. Ara: Haha. And lastly, who is your favourite ‘friend’ from F.R.I.E.N.D.S.? That's really interesting about David studying as a plant biologist - glow in the dark trees would be amazing, haha!